Maintaining a naturally beautiful smile can be a significant challenge when you’re missing a tooth. Whether you’ve lost a tooth due to an injury, periodontal disease or a failed root canal, Dr. Reem Kidess, DDS and her talented team in Scottsdale can provide dental implants to restore your smile again. A dental implant provides several advantages over other tooth replacement options. A dental implant replaces both the lost natural tooth and its root. Dental implants are secured into bone allowing them to function like a natural tooth. These teeth implants are independent of any adjacent teeth, and therefore do not involve touching or grinding down the adjacent teeth which would be required in a traditional cemented dental bridge. With dental implants the bone and gum are better preserved. With a dental bridge, bone in the missing tooth site will almost always resorb causing ridge deterioration over time. With dental bridges, gums will often recede also. This is not the case with dental implants because they integrate with your jawbone. Dr. Kidess’s dental practice in Paradise Valley, AZ can replace a single missing tooth, or provide multiple teeth implants to fix your smile. This is ideal for patients who want to avoid the discomfort, hassle and maintenance of dentures, partial dentures, and bridges. Dr. Kidess’s dental implants are made with titanium roots, which ensure a snug and precise fit within the extraction site. For single-tooth extractions, Dr. Kidess can provide patients with the option of choosing between a screwed-retained crown or an abutment-retained crown. 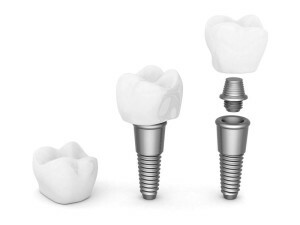 A screwed-retained crown involves screwing the dental implant directly into a titanium screw, which is then sealed with a filling. For an abutment-retained crown, patients can choose between a gold, titanium or tooth-colored abutment, which is connected to a titanium screw and is fitted with a life-like crown. Both options provide life-like results, meaning your family members and friends will never guess your secret. Don’t let a missing tooth keep you from smiling. Let Dr. Kidess restore your beautiful smile again with natural-looking teeth implants in Paradise Valley. Dr. Reem Kidess approaches each patient from a unique and highly personalized perspective. Each client will be provided a multitude of options, with Dr. Kidess walking you through how each one can meet your dental implant needs. With more than a decade’s worth of experience, Dr. Kidess can ensure that your smile is beautiful and perfect again. To schedule a consultation with Dr. Kidess, contact our Paradise Valley dental office at (480) 991-2290.